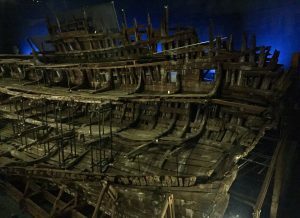 Henry VIII’s warship, the Mary Rose, sunk in the Solent in 1545 and was left to sleep on the seabed for hundreds of years. In 1982 she was raised and her home since has been Portsmouth’s Historic Dockyard. On Wednesday 14th February this was the destination of two minibuses and their cargo of conservation students from Cardiff University. Excitement was slightly dampened by the early hour, and more literally so by the rain, which began as I left home that morning and continued until I set foot through my front door again in the evening. However, as we trundled along the M4 I couldn’t help but wonder what the day had in store. Almost four hours later we emerged onto a street in Portsmouth, opposite the entrance to the dockyard, and waited for the second minibus to arrive. Rumours swirled that they had taken a wrong turn somewhere, but we were soon reunited and a soggy ensemble of students trooped through the gates to be met by some of the team from the Mary Rose Trust. Our guide for the day was David Pearson, a Cardiff University alumnus, and now conservation manager at the Mary Rose. He handed out security passes for everybody to allow us access to the naval base where the conservation facilities are located and before long we were standing in their large warehouses. Glad to be out of the rain it took a moment to realise it was colder in there than it was outside, but I virtuously thought of the benefits to the objects contained within and not of my own chattering teeth. We were ushered past some huge tanks and into the storage area where we were permitted to visually examine some of the artefacts. These included sections of rope and timbers, and also an iron gun which had been brought up in the nineteenth century and left untreated. The corrosive effects of this were immediately apparent and we were told it was now unsuitable for display but extremely useful for research. We were led out of the store room to be shown some examples of stone shot. These were in need of conservation; there was iron staining and calcium carbonate to remove, as well as the process of desalination. There were also bricks, lots of bricks! 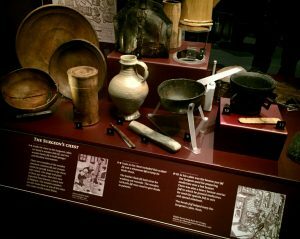 In fact some four and a half thousand of the objects raised so far are bricks from the ship’s galleries, and we were told the museum has in the past been asked by visitors to sell them as souvenirs, of course they declined! Once we had recovered from the shock (objects as souvenirs!) 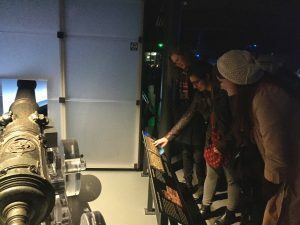 we moved on to look inside the tanks. 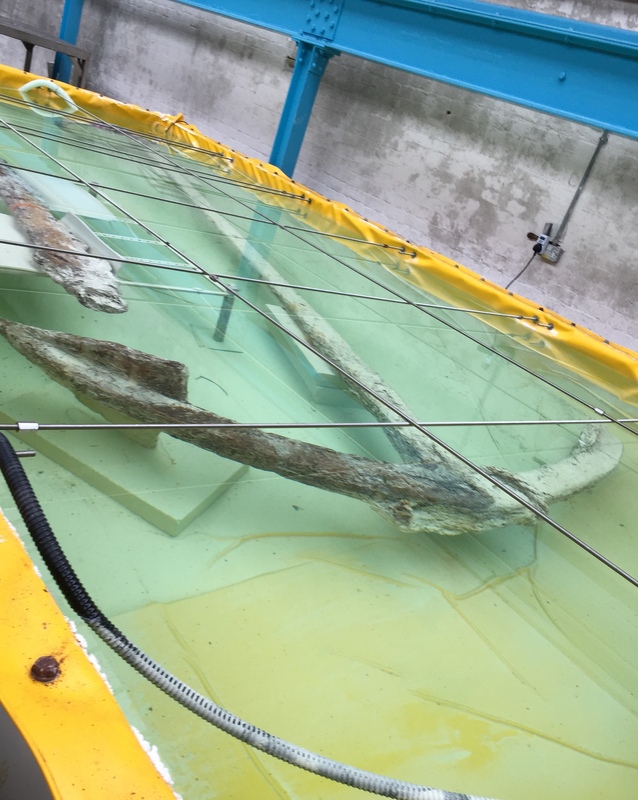 I could guess from the dozens of barrels of polyethylene glycol (PEG) we passed that it was going to feature in many of them, and it did, but first we were shown the only intact anchor, which is in a tank filled with sodium sesquicarbonate. This solution helps to passivate the corrosion of the metal and the anchor has another ten years to go before it can come out. Wooden objects and structures filled many of the tanks, immersed in liquid solutions of PEG where it was busy penetrating the wood and displacing water in the cell walls. The hull was also treated with PEG although an alternative method of spraying was used, for obvious reasons! Next we were shown a colossal freeze dryer, 6 metres long, where objects will go after PEG treatment to drive off any remaining water. We also saw the environmentally controlled workroom where objects could be left out while they were being treated. We all enjoyed the tour immensely and our sadness at it coming to an end was only lifted when Johanna announced it was time for lunch. Fortified from the offerings in Boathouse No. 7 we once again braved the rain to dash past the glorious HMS Victory and in to the Mary Rose Museum. We watched a brief film re-enacting the harrowing scenes from the crew’s final moments as they were claimed by the sea, and then finally we were in front of the ship itself. The structure that now forms the focus of the museum is the only 16th Century warship on display in the world. The significance of this was not lost on me and along with everybody else I spent a few moments just trying to take it all in. The best view is from the upper level, through an air lock system, where you can look down on the hull without any barriers and fully appreciate the scale of the ship and the incredible vision of those involved with the display. Additional effects such as the lighting and ominous creaking noises create a dramatic and engaging spectacle. On each level the ship is surrounded on three sides by display cases filled with a wealth of various artefacts. I was amazed at how many have survived, thanks to the protective environment provided by the sediment on the seabed in which much of the hull was entombed. 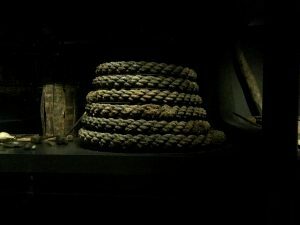 Along the length of the ship are the larger artefacts, many associated with her construction such as guns and anchor cable, and in each room at either end are the personal effects of some of those on board. Many of the cases tell a story, such as the one displaying the objects connected with the ship’s surgeon. I could see how displaying the objects in this way was helpful to the museum’s visitors but with so many different materials combined in each case I could think only of the conservation challenges it must create! 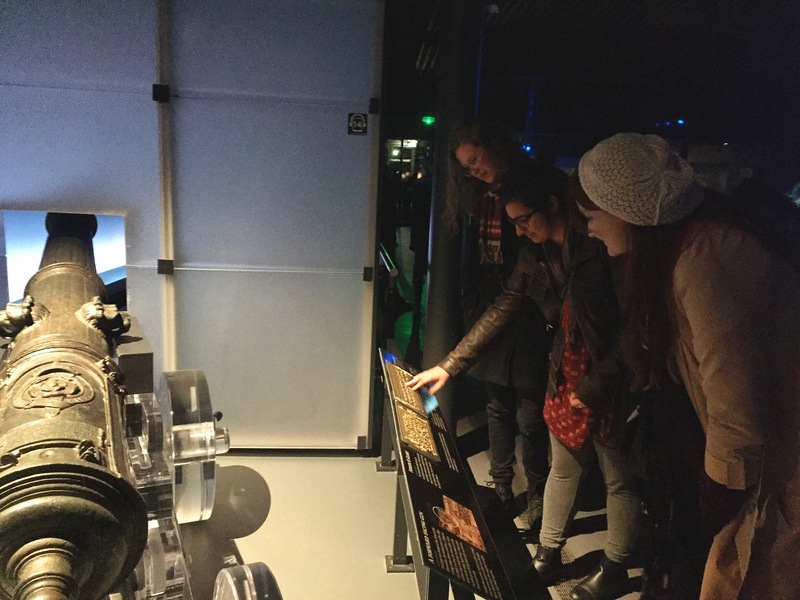 Some of the exhibits are interactive, giving visitors the chance to engage in new and exciting ways and even touch replica – and one or two authentic – artefacts. Soon four o’ clock rolled around and we started to make our way back to the meeting point, though of course there were a few minutes to spare in the gift shop, and then it was time to say goodbye to rainy Portsmouth. As our minibus started the journey home it was clear from the commentary on board that it was an overwhelmingly positive experience for everybody who went, me included, and I am very much looking forward to planning another visit someday to the marvellous Mary Rose. Thank you to David Pearson and his colleagues at the Mary Rose, Johanna Thunberg for her organisation and David Watkinson and Graham Getheridge for driving duties.